It’s hard to believe it’s already winter again. Where does the time go? Here in North Carolina, we already have a few snowstorms under our belt — and it’s only December. Today, as this is being written, schools are closed because of snow. Just like that, with the onset of cold weather, many motorcyclists will abandon their bikes to the garage until spring with little or no storage prep. What a great opportunity for service departments. If you’re not selling winterization packages, there’s still time. If you have space at your shop, you might want to think about selling vehicle storage as part of the package. Not everyone is lucky enough to have a garage and it might be just what your customers are looking for. Batteries are certainly a consumable but many die long before their time due to improper maintenance. A battery in a poor state of charge, left out in the cold, may never hold a charge again. In order for a battery to survive the winter, it should be connected to a smart charger when not in use. Modern computer-controlled chargers can accurately sense the battery state of charge and will keep a battery at peak charge. Be careful when using older-style trickle chargers as they can overcharge and do more harm than good if left connected for more than a few days. 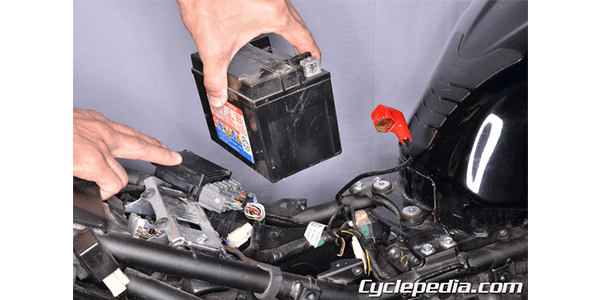 If the battery is serviceable, make sure to top it off with distilled water before charging. If your customer is not taking advantage of your storage services then be sure to encourage them to remove the battery so that it is not subjected to repeated freeze and thaw cycles. The average basement temperature is fine for a battery. The point here is that battery longevity is increased by keeping it at peak charge in a stable climate. If your dealership is offering cold storage, move batteries to a central storage area, convenient to a bank of battery chargers but label each battery so its spring destination is clear. It’s not that uncommon for a rushed serviceman to mix up batteries. This can be time-consuming and expensive, and easy to avoid with a paint marker or a tag. Fuel system problems are becoming less commonplace with fuel-injected bikes now dominating the market, but these systems still require proper care. Expensive components, such as fuel pumps, are destroyed by improper storage. Treat the fuel system as soon as you decide you will no longer use the machine for the season. Add a good fuel stabilizer to the fuel tank and top off the tank with gas. Run the engine long enough to ensure that the stabilizer works its way through the fuel system. Why fill the tank to the top? A full fuel tank has less air space to allow condensation to occur when the machine is subjected to the repeated temperature cycles in a typical garage. Condensation will cause spots of rust to form inside a steel fuel tank, and the resulting water will settle to the bottom of the tank and eventually eat holes in the steel. It’s worth noting that cold-stored machines (bikes left outside) should be examined closely for existing water in the fuel tank before being put away. If there’s any doubt, draining the fuel system is the best way to avoid more headaches in the spring. When topping off the fuel tank we encourage the use of ethanol-free fuel, if available. Ethanol fuel will degrade seals in older machines. For a classic machine, like a mid-’70s Honda CB, we would caution the owner to drain all traces of E-10 fuel from the petcock down — and then we’d keep an eye on that petcock, too. Old, classic motorcycles were not designed for E-10 fuel and its common additives, and many vintage carburetor parts will degenerate if left soaking in E-10 for the winter. You may choose to offer an oil and filter change as part of your winterization package. Bikes that are stored outdoors or used for short rides can build up condensation in the oil. Removing moisture-laden oil from a bike will prevent internal parts from rusting and pitting and your customers’ bike will be ready to ride come spring. Conducting a safety inspection should be done as part of this service. It’s a good time to find things that are wrong so there is time to fix them before the riding season resumes. It gives a customer who is reluctant to want to spend the money more time to think about fixing problems. A handy DIYer might even decide to let your shop fix the issue and not fool with it. Either way, you have identified if there are any problems and given them the opportunity to address them. A safety inspection should include a 360-degree visual inspection. Is there anything obviously wrong like a footpeg bolt missing? It’s amazing how many customers ride their bikes but just don’t ever take the time to look them over. Check the engine bolts — are they loose? Do the axles have nuts on them? Do the nuts have cotter pins if equipped? Check the fuel lines for cracking. Inspect the exhaust system. Muffler bolts loosen with vibration and can eventually fall off. Check the frame for cracks and suspension for proper operation. Check the feel of the steering head. Inspect the tires for wear and proper inflation. 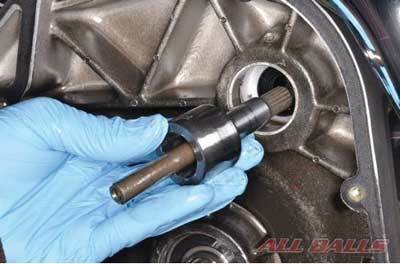 Inspect wheel bearings and brake pads and brake fluid levels. If the bike has a chain, inspect the chain and sprockets. Check the belt if equipped or check the final drive oil on bikes with driveshafts. Look for leaks anywhere and everywhere. Do all the lights work on the gauges? Beep the horn, check the headlight, brakelight and turn signals. Check the controls for proper operation, lube any cables. Inspect spark plugs, check coolant levels. You get the point. Winterization should be an easy sell. It’s akin to the relationship we have with our dentist. We’re going to pay them either way, it’s just a matter of when. Don’t brush your teeth now and there will be pain and we’ll be paying more later. Brush now and go for regular checkups and we’ll be ready to roll with less cash out of pocket. Don’t feel bad pushing winterization services to your customers. This is one of those cases where you do know better. You see all the dead batteries every spring and the bikes that won’t start or work right because they were neglected. Because of what you’ve seen, you can and should wholeheartedly sell them winterization. You’re helping your customers save time and money and keeping their bike ready to ride when the weather turns. Cyclepedia Press LLC authors powersports service manuals, a specification database and training modules to help technicians efficiently service ATVs, motorcycles, scooters and side-by-sides. Each month, Cyclepedia examines real-life shop scenarios with recommended tech tips for handling the problems encountered. For more information about Cyclepedia manuals and professional products, visit cyclepedia.com.